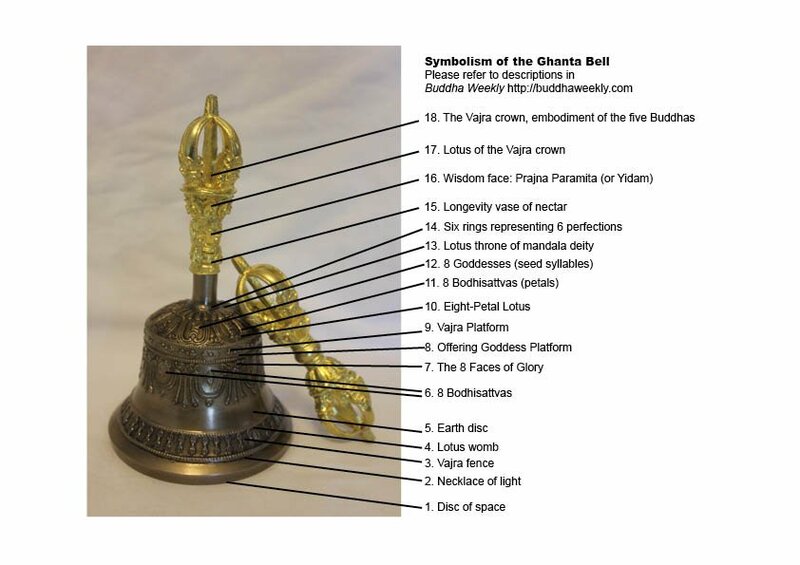 But why does the Bell and Dorje hold such a prominent place in Buddhist practice? What is so special about these seemingly simple—yet endlessly profound—ritual implements? The Ghanta or Bell is never separated from the Vajra or Dorje. 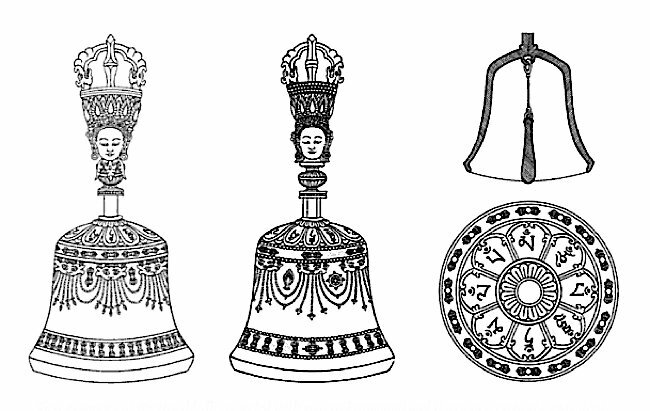 Both the Bell (shown) and Vajra contain endless symbolism. 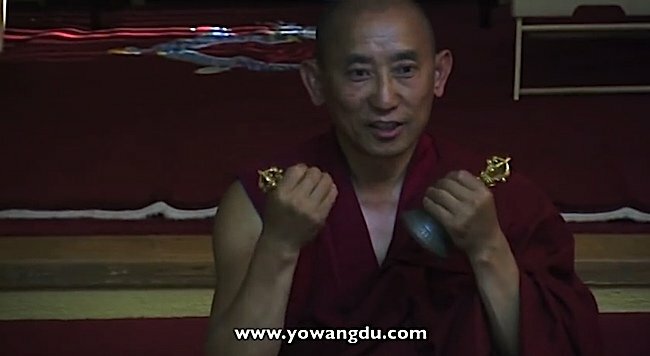 Holding the Dorje in the right hand symbolically connects us to the Buddhas (and especially our own Yidam). 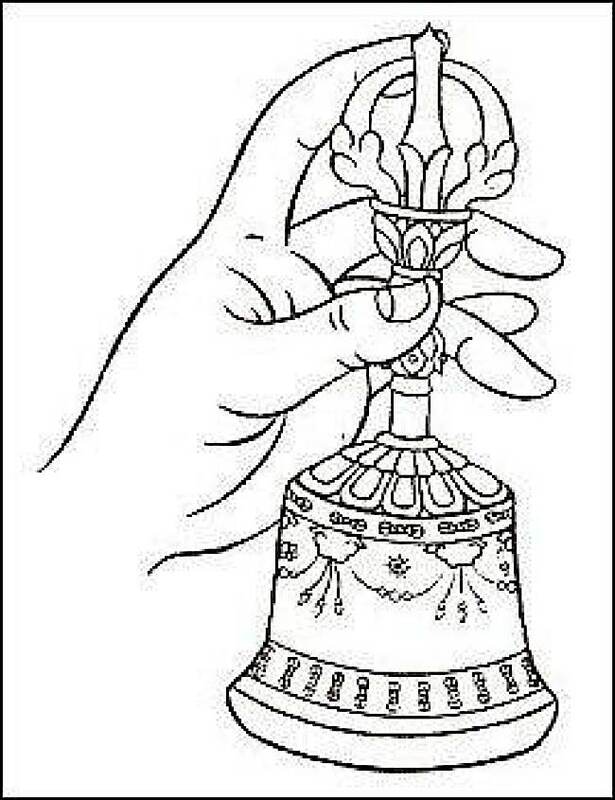 Holding the Bell (Ghanta) is like cradling the entire mandala of the Yidam. The Bell is wisdom and emptiness. The Dorje represents means and compassion. Refer to the legend (above) for the full symbolism for the Bell. Personal meditation Yidam deity (the Dorje), and your deity’s mandala (the Bell). Bell and Dorje together symbolize the penetrating wisdom and compassion of the Heart Sutra. 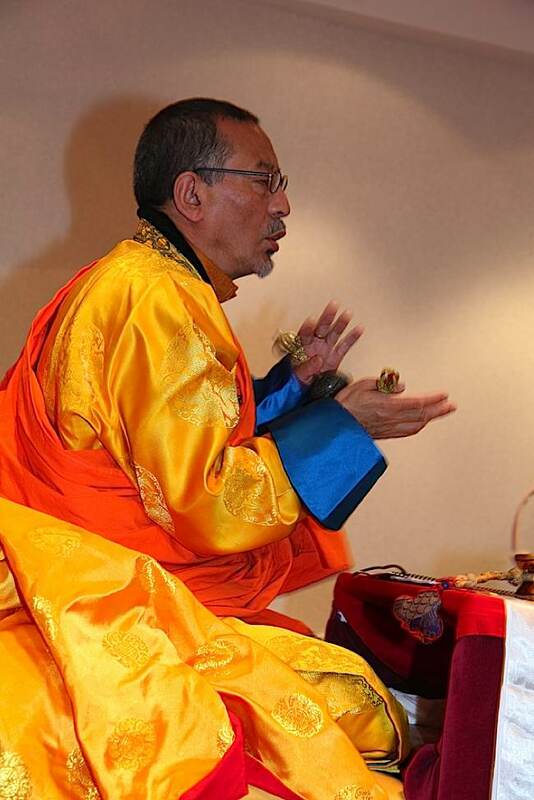 His Eminence Zasep Tulku Rinpoche using Bell and Vajra during an empowerment. 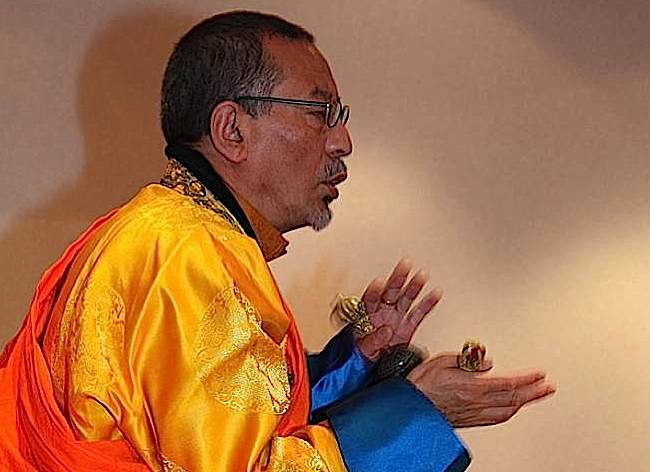 Zasep Rinpoche is the spiritual head of a number of Buddhist Centers, including Gaden Tashi Choling Retreat Centre in Nelson, BC, Canada, Vancouver, BC, Calgary, Alberta, Toronto, ON, Ottawa, ON, Thunder Bay, ON, Seattle, WA, Moscow, ID, Kalamazoo, MI, and Tasmania, Australia. Literally, each time we meditate with the Bell and Dorje we are engaging with a symbolic compendium of teachings of the Buddha. At the highest level, the very face of Wisdom—Pranjna Paramita—appears on the handle of the Bell. Hand Mudras: How to use the Vajra and Bell: This is a video featuring Ven. Thupten Donyo of the Gyuto Vajrayana Center of San Jose. In the class, Ven Donyo teaches you how to use the Vajra and Bell with your offering mantras. At the purest and simplest level of understanding, some teachings indicate the Bell (Ghanta in Sankrit) represents the Perfection of Wisdom (Prajna Paramita, in Sanskrit)—wisdom, which directly realizes emptiness. The Dorje, (or Vajra in Sanskrit), the bell’s inseparable companion, represents compassion, form and means (or method). Simply put, they are inseparable symbols, because together they represent indivisible emptiness and form. Or, put another way, wisdom and compassion. In Mahayana Buddhism, both wisdom and compassion—together—are the path to Enlightenment. The imagery, however, of these near ubiquitous ritual implements, is as vast as the discerning mind cares to penetrate. A nine-pronged Ghanta and Vajra set with copper case and Mahakala face. This is a specialized set, with particular symbolism, handcrafted by artisans in Nepal. At the highest level, the Bell and Dorje together symbolize the penetrating wisdom and compassion of that most important of Sutras—the Heart Sutra. “Form is empty. Emptiness is form,” proclaims Perfection of Wisdom Sutra. If the Dorje is form, the Bell is emptiness. Put another way, compassion and wisdom, the path to enlightenment. As symbols and ritual implements, they are inseparable from the practitioner, in the same way form and emptiness are inseparable in the sutras. 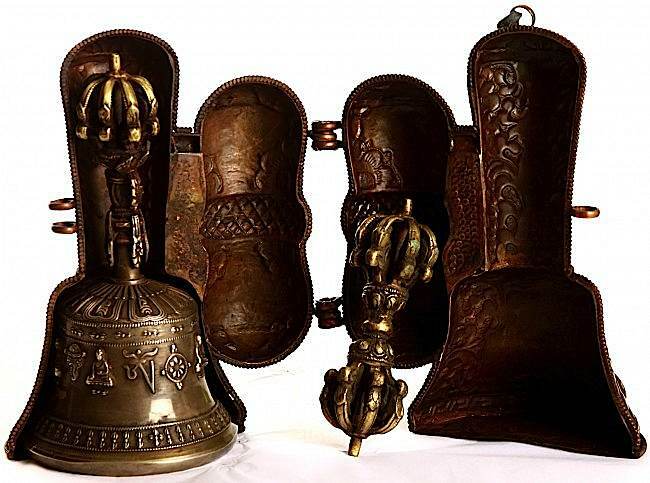 Traditionally, the Bell and Dorje must never be separated from each other, either placed together in a place of respect, or held simultaneously by the practitioner, Bell in left hand (wisdom hand), Dorje in right (method hand). But—always together. Thought of another way, the Bell is the Feminine principle (wisdom) and the Dorje is the Male principle (compassion). In the same way that the entire Heart Sutra can be represented by the great Perfection of Wisdom mantra—Gate Gate Paragate Para Samghate Bodhi Svaha—so, too, does the Bell and Vajra physically represent form and emptiness, compassion and wisdom. Literally, the sound the Bell generates “proclaims the sound of emptiness.” The Bell also represents speech, sound and sacred mantras. Sound, as a metaphor for wisdom, suggests emptiness. In ancient belief, the relative universe arouse from a sound. Because the Bell and Dorje should never be separated, even the “carry case” ensures they are carried together. The Vajra case is permanently attached to the bell case. The mouth of the bell, the open dome that generates the sound of emptiness, represents the sixth —and “female”—perfection of wisdom. How to correctly hold the Bell or Ghanta. The wonder of the Bell is the entire Deity Mandala contained within—and without. Contained is really the wrong word, since we’re talking about emptiness (wisdom)—but it’s the easiest way to describe symbols. Literally, the entire relative universe—or in particular practices—the mandala of the Deity, is represented on the extraordinary Bell. Any serious practitioner will immediately recognize the symbols as the mandala of the deity. 1. Disc of Space: the outer rim of the bell represents the outer disc of space. 2. Necklace of Light: as the bell tapers in in mandala shape, the first ring of malas or rosaries (pearls or conch) represent the outer protection circle of the Necklace of Light—protecting the mandala from conflagration (the poison of aggression), earthquakes (the poison of ignorance), and floods (poison of desire). 3. Vajra Fence: the second protective circle of the mandala as 32 or 65 upright Dorjes (Vajras). 4. Lotus Womb: the upper level of pearls or malas (surmounting the Vajras) is the third protective circle. 5. Earth Disk: above the Lotus Womb is an open, unadorned area, representing the disk of earth. Lineart mapping the symbolism of the Ghanta or bell. 7. Eight Faces of Glory: above the Bodhisattvas are eight faces of glory, and hanging from their fierce mouths are strings of pearls and jewels. These kirtimukha faces represent the eight makara heads of the immense Vishva Vajra (double Dorjes crossed) that supports the central mandala palace. In Chod practice, the eight faces also represent the eight great charnel grounds or cemeteries. 8. Offering Goddess Platform: the two rows of pearls above the eight faces represent the decorations of the offering goddess platform and walls. 9. Vajra Platform: The horizontal Vajras above the Goddess Platform represent the eight or sixteen emptiness’s and also the indestructible Vajra Platform, the material of the mandala’s central dais. 13. 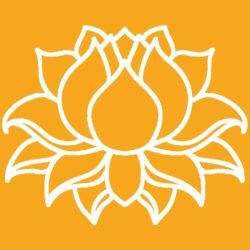 Inside the lotus, surrounding the stem of the bell, is a smaller lotus of 24 or sometimes 32 spokes, representing the lotus-throne of the mandala’s central deity—you can visualize either Prajna Paramita, the face of the Perfection of Wisdom who adorns the bell, or the mandala of your Yidam deity. 14. At the base of the handle, and under the crowning vajra (which always tops the bell), are six more rings, representing the six perfections of the Prajna Paramita. 15. Between the three top rings and the three bottom rings is a square or round base, representing the longevity vase of nectar. 16. Above the vase, is the very face of wisdom, the ultimate wisdom Mother Pajna Paramita, wearing a five-wisdom jeweled crown and with her hair bound, representing the binding of all diverse views into a single non-dual reality. 17. Above the Goddess is the lotus base of the vajra crown. 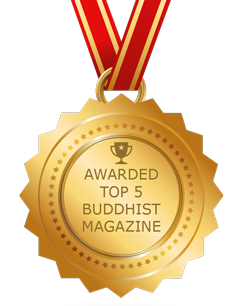 The vajra crown is the very embodiment of the Five Wisdom Buddhas: Akshobya, Amitabha, Amoghisiddhi, Vairochana, and Ratnasambhava. Note: Some bells have a finger-whole, for the ring finger, replacing the longevity vase and sometimes the face of Prajn Paramita. This represents emptiness. A five-pronged vajra, revealing the details such as the lotus, the pearls, prongs and other symbolism. 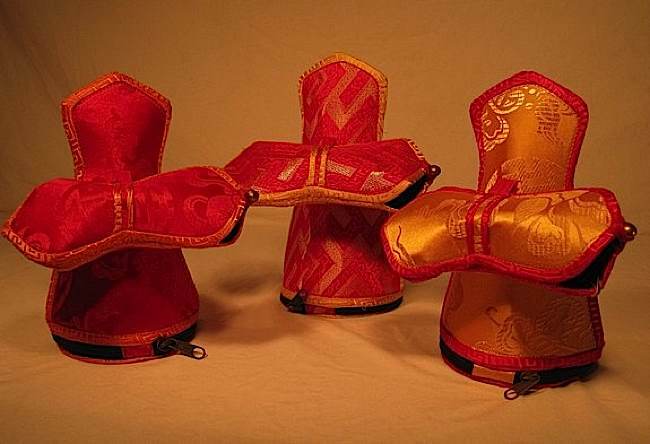 Always held in the right hand, and never separated from the bell, is the Vajra or Dorje. At another level of symbolism, the two reflected ends of the vajra represent samsara and nirvana, connected by the actual reality of emptiness (sphere). At yet another level of symbolism, the vajra in total represents the activity and compassion of the yidam, where the bell represented the yidam’s mandala. In one subtle interpretation of the vajra, the subtle body and nadis are mapped to the permitter outline (channels) and nadir (intersecting points of the vajra. The center globe or hub represents dharmata (in Tibetan chos nyid) which is the sphere of actual reality—in other words emptiness. Whether inscribed, or visualized, the sphere contains the seed syllable (bija) of the syllable Hum. The dharmata containing the Hum represents the three sounds symbolizing the groundlessness of all dharmas (subjective truths). These are H (Hetu) for freedom from causation (karma and samsara), U (Uha) ror freedom from conception, and M for freedom from transformation. The closed prongs represent the perfection of the yidam’s method or skillful means (upaya in Sanskrit, thabs in Tibetan). On both sides of the central sphere, are equal-numbered prongs (vajras) on thrones of lotus. The prongs themselves are normally square if viewed as a cross-section, rather than round, with the tips themselves coming to a point, like a jewel (or a pyramid). Sometimes, the central prongs represent the subtle body (microcosm of the sentient being) while the four prongs surrounding represent the four directions and the four faces of Mount Meru (the symbolic center of the universe)—which together represent the universe (macrocosm). Sometimes, on detailed vajras, we see four mouths of makaras (Sanskrit word, describing a sea dragon, a hybrid of a giant crocodile and fish) rising from the moon disc, from which the four surrounding prongs emerge—symbolizing the four immeasurables, the four doors to liberation, the four joys, the four directions and the four purified elements of fire, earth, air and water. Other vajras might have the prongs emanating from extended lotus petals. 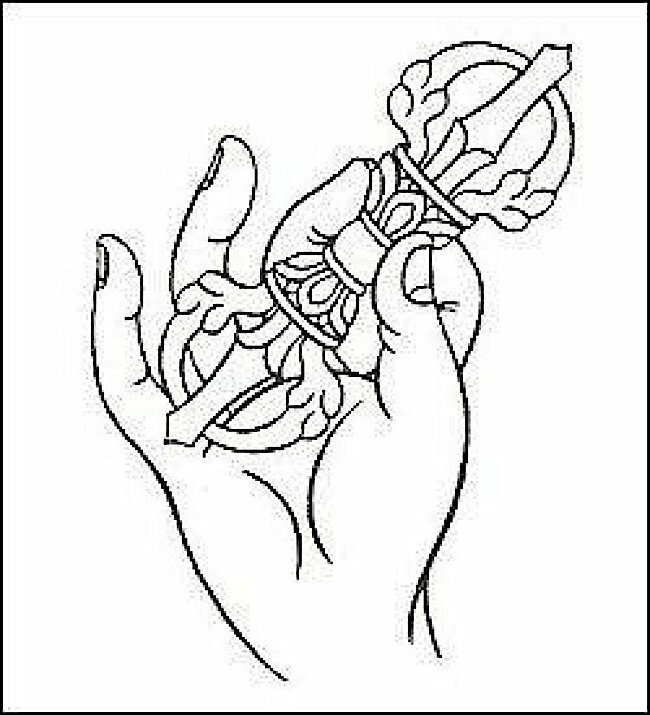 How to hold a vajra. There are several mudras with different “holds”. This is just one. 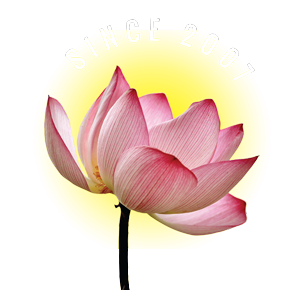 The eight-petals of the lotus thrones, represent the eight great male Bodhisattvas and the eight great goddesses or female Bodhisattvas. The sixteen petals also represent the sixteen kinds of emptiness identified in the sutras. On top of the lotus are circular flattened moon discs Above the lotus bases are three rings of pearls. The three rings on both ends, totaling six, represent the six perfections: generosity, morality, patience, energy, concentration and wisdom. Collectively: the ten directions, the ten perfections and the ten stages (grounds) of the Bodhisattva path. Mandala of the center and the eight directions. There are many different types of Vajra. They basically fall into two broad categories. Those with “closed prongs” are suitable for all practices, while the “open prongs” are only meant for specialized practices, given out by a qualified teacher, and generally wrathful. Three Pronged Vajra: represents the Three Jewels (Buddha, Dharma, Sangha), and sometimes the three kayas (three bodies of a Buddha: Dharmakaya, Samboghakaya, and Nirmanakaya). It also symbolizes the overcoming of the three poisons of desire, aversion and ignorance and furthermore, control of the three times, past, present and future. It also symbolizes the three realms (below, upon and above). 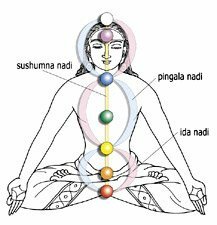 Finally, it represents the three main channels (nadi) of the subtle body. Five Pronged Vajra with closed tines (typically for Sarma traditions: Gelug, Sakya, Kagyu and Jonang): see main description above. Twelve Pronged Vajra (vishvavajra), a crossed vajra or double vajra. Twenty Pronged Vajra (vishvavajra), a crossed vajra or double vajra. Thanks for putting this together. Is this information from a Buddhist Root Text and if so, possible to let me know which text? 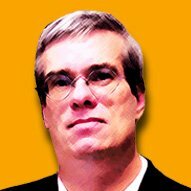 No root texts were referred to. Our sources were quite varied on this story. Of course, my own introduction to the Vajra and Bell was my own teacher, but for this article — specifically relating to symbols — we referred to Robert Beer’s The Encyclopedia of Tibetan Symbols and Motifs, Lama Yeshe Wisdom Archive, Vessantara’s “The Vajra and Bell (Buddhist Symbols) (Windhorse Publications), The Treasury of Knowledge Book6 (Jamgon Kongtrul), The Buddhist Tantras: Light on Indo-Tibetan Esotericism, Images of Enlightenment, and other sources. Instruction in use of Bell Vajra, of course, appears in many commentaries, but here I’m referring to the symbolism discussions. In kindness, Lee.